Kinkaku-ji literally means Temple of the Golden Pavilion and is situated on the north west side of Kyoto, Japan surrounded by beautiful gardens. It was formerly known as Rukuon-ji or Deer Garden Temple and was originally built as a villa by Ashikaga Yoshimitsu, who had taken possession of a mountain villa of Saionji Temple in 1397. It was converted into a temple after Yoshimitsu's death. 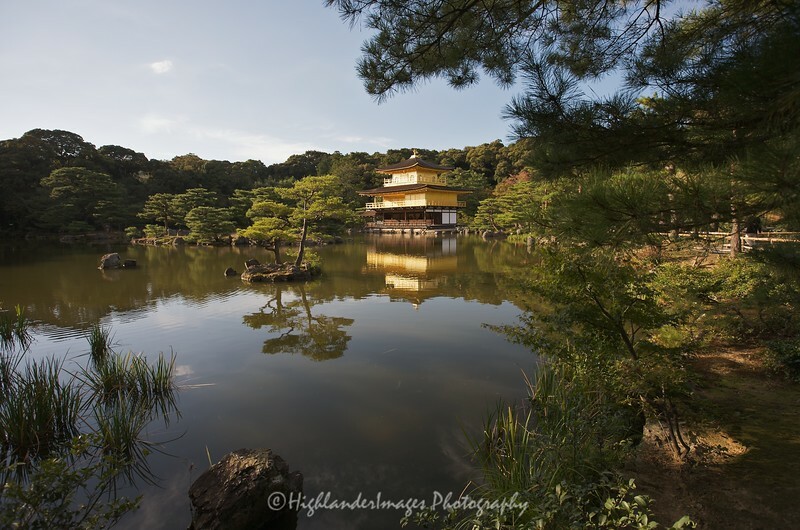 Covered with gold, the image of the pavilion, which stands at the edge of Kyoko-chi pond (mirror pond), is reflected in the water. Major repair work performed in 1987 has further enhanced its brilliance.The elegant, harmonious building consists of three types of architecture. The 1st floor is Shinden-zukuri, the palace style. It is named Ho-sui-in. The 2nd floor is Buke-zukuri, the style of the samurai house and is called Cho-on-do. The 3rd floor is Karayo style or Zen temple style. It is called Kukkyo-cho. Both the 2nd and 3rd floors are covered with gold-leaf on Japanese lacquer. The roof, upon which the Chinese phoenix settles, is thatched with shingles. Recently, the coating of Japanese lacquer was found a little decayed and a new coating as well as gilding with gold-leaf, much thicker than the original ones, was given to the building and was completed in 1987. Furthermore, the beautiful painting on the ceiling and the statue of Yoshimitsu were restored, with utmost care, to their original splendour. The classic tea house is called Sekka-tei. In Sekka-tei there is a celebrated pillar made of a nandin. The house was restored in 1997. On the way to the exit of the temple, you will find the small Fudodo shrine where the stone Fudo-myoc (Acara) is enshrined as a guardian.